Überblick über Geschichte und Einsatzmöglichkeiten von Concept Maps. Erweiterung um zyklische Concept Maps, um dynamische Vorgänge abbilden zu können. 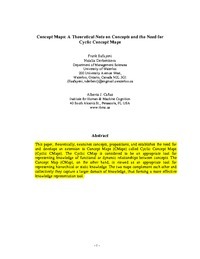 This paper, theoretically, examines concepts, propositions, and establishes the need for and develops an extension to Concept Maps (Cmaps) called Cyclic Concept Maps (Cyclic Cmaps). The Cyclic Cmap is considered to be an appropriate tool for representing knowledge of functional or dynamic relationships between concepts. The Concept Map (Cmap), on the other hand, is viewed as an appropriate tool for representing hierarchical or static knowledge. The two maps complement each other and collectively they capture a larger domain of knowledge, thus forming a more effective knowledge representation tool. Safayeni, Derbentseva, and Cañas (2003) presented an idea about cyclic concept maps, which are hierarchical. This is a special case of an improved method of concept mapping in which the concept map can be constructed in any way that is the best justified option. This is because according to modern science, the world is a system and everything in the world is connected. Der Mensch kann 7 (+/- 2) Dinge gleichzeitig memorieren oder unterscheiden.